After 6 months of cloth diapering a baby, I finally feel like I can write this post as an expert. Not that I know it all, but I’ve done lots of research plus had hands on experience now. I decided I should write this for all the mommas and future mommas who have asked me about my experience with cloth. Some people are just curious and others are wondering if it’s an option for them. So this will be my 2 cents on cloth that I can send people to read when they ask me! If you want more info, here’s a great link that I used to get started. I remember the look of shear horror and confusion on Mike’s face when I said that I wanted to cloth diaper Lincoln. He was so concerned, and he was definitely not on board with the idea at first. He had no clue about modern cloth and said he didn’t want to use safety pins on the baby. He started to change his tune when I stated the facts about cold, hard cash. Most experts say that you can plan to spend anywhere from $1,000-$3,000 on disposable diapers for your baby from birth through potty training. That number varies depending on how often you change baby’s diaper, what brand you buy & how long it takes your child to become potty trained. I figured out that I could spend around $550 on everything I would need to cloth diaper Lincoln from birth until he’s potty trained. So after baby number one, I’ve already saved myself some money, but the enormous savings will come when baby number two arrives one day. It basically won’t cost me to diaper him/her. Now I could have spent less on my stash of cloth diapers, and I could have spent more. There are definitely ways to diaper your baby for only $100-$200. I chose to go mid-grade with my stash. Some moms have to use cloth because their babies’ bottoms are super sensitive. Putting cotton up against your baby’s bum is obviously a lot gentler than the ingredients of a disposable diaper. I’m thankful we chose cloth, because Lincoln’s skin is definitely on the sensitive side. If he wears disposables for more than a day, his poor bottom becomes extremely red and irritated. He still has some irritation with the cloth, but it’s much, much less. There’s really no question that cloth is better for the environment than disposables. Some of the info I’ve found says that it can take hundreds of years for a disposable diaper to decompose in a landfill. I’m definitely no tree hugger, but I do want to be responsible and be green when it’s possible. It’s not possible for me to get rid of my car and ride my bike everywhere, but it is possible for me to use cloth diapers. When we used disposables for the first two weeks of Lincoln’s life, I couldn’t believe how fast our garbage can filled up! It was crazy. It really made me happy that we had chosen cloth. Do cloth diapers still use resources? Absolutely, but it’s pretty obvious that my 20 or so diapers don’t use as many resources as the hundreds it would take if I used disposables. The diapers I use aren’t your grandma’s cloth diapers. They are what we call Modern Cloth and they are super user friendly in my opinion. I use a combination of All-in-Ones, Hybrids & Pockets. I used some prefolds and covers until Lincoln was about 10 pounds or so, then I switched to the others. Here are the basic types of diapers you can choose from. Prefolds look like the old school cloth diapers, but you no longer need to use pins for them. You can use a cool little contraption called a Snappi instead and eliminate the worry of poking yourself and/or baby. If you use prefolds, you’ll need covers to go over them. There are all kinds of covers our there. Some come in different sizes and some are called one-size. One size covers usually fit babies from 10-35 pounds. The sized covers come in XS, S, M, etc. Pros to Prefolds: By far the cheapest method of diapering. You can get a diaper for around $1.00-$2.00. If you buy one size covers, you’ll save even more. I used Chinese prefolds and Thirsties XS covers for the first couple of weeks that we used cloth. Cons to Prefolds: Not as simple as some of the other diapers. This is the next cheapest method to prefolds. These usually come with one size covers and separate inserts. Some people use fabric inserts, some people use biodegradable inserts that are flushable. We have lots of Flips in our stash. I’ve also heard good things about Econobum if you’re on a tight budget. They claim you can get everything you need for $100. Pros to Hybrids: Pretty cheap way to fill your stash. We’ve never had any leaks when using a Flip. Fits in the diaper bag really nicely. Cons to Hybrids: Since the insert & the cover aren’t attached to each other, it takes a little practice to get them on a wiggly baby quickly. I have a really, really active baby who makes diaper changes a challenge, but after a few changes, I quickly became a pro, and I’m pretty sure I could put a Flip on him in my sleep now. 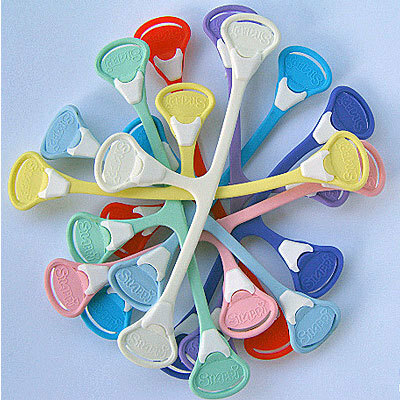 Pocket diapers are super easy to use and really similar to disposables as far as ease of use goes. Like the name suggests, they have a pocket that you stuff with an insert. 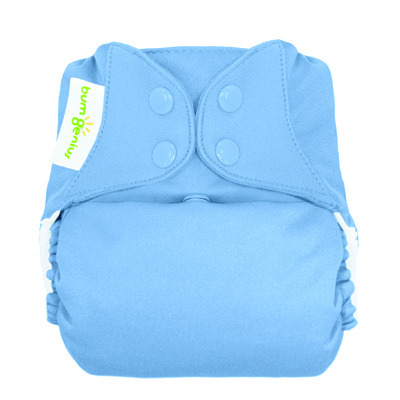 We use BumGenius 4.0 pocket diapers for overnight. I can double stuff them and they keep Lincoln dry even though he sleeps 10-12 hours a night. Pros to Pockets: They are really trim and easy to use. They contain leaks really well. Cons to Pockets: They aren’t as cheap as the other diapers I mentioned earlier. It takes an extra minute to stuff them. Just like the name says, these are all-in-one. They’re the most like disposables in the sense that you don’t have to stuff or attach anything. The diaper is just one piece of material. These were great for Mike in the beginning when he wasn’t too sure about using our new diapers. They’re also great for babysitters or family that may be intimidated by the other diapers at first glance. 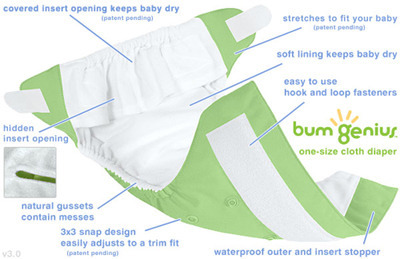 We use BumGenius. Pros to AIOs: Super easy to use. Cons to AIOs: The most expensive method of diapering. Ease and convenience come at a price. One of the great debates. I have some of both. My verdict? Velcro is easier, but snaps are more durable. I prefer snaps because I want my diapers to last a long time. I hear that you can get your velcro repaired, but I’ve just chosen to use mostly snaps. There are tons of different detergents out there, but I like to keep things simple. There are certain detergents you should not use on your cloth diapers, so you have to do some research. I use original powder Tide. After diapering for more than 6 months, I’m barely into my second box. You only use about 1/3 of the amount of detergent you would use on a load of clothes. My washing routine is to do diapers on Monday, Wednesday & Friday. It’s only 1 load that I have to do and it’s really quick & simple. I take my hanging wetbag and just dump it all into the washer. Once a month I use a tiny bit of bleach. After the wash, I hang my diapers on a $12 drying rack from Target and let them dry in the sun outside. Drying outside in the sun helps fight stains and saves me money! A few of my organic cotton diapers get stiff in the sun, so I toss them in the dryer on the de-wrinkle setting and let them stay in there 10 minutes to soften them up. What about when you’re on the go? I used to be scared to use cloth when we were out, but it’s really no big deal. I use a small wetbag to store the dirty dipes in until we get home. As far as traveling out of town goes, I’ve done both methods. I’ve used cloth when we were on a trip and I’ve used disposables. It really depends on whether or not I’ll have access to a washing machine. If I won’t have access to a washer on our next trip, I think I’ll use a biodegradable liner. There are lots of these to choose from. This way I can still be green even away from home. Do you ever use disposables anymore? Not really, but I usually have a few on hand just in case I get behind on laundry. In 6 months, I think I’ve only had to use them twice because of not having any clean cloth. As I mentioned above, I have used them for trips out of town before. I’m not “anti-disposable” diapers or anything. I’ve just come to love cloth. The entrepreneur in me appreciates the fact that most of the cloth companies are smaller businesses started by moms rather than the huge corporations that make disposables. How do you decide what to buy for your stash? I think it’s best to have different types of diapers to fill your stash with. My prefolds were great for when Lincoln was a little too small for the others. My AIOs are great for babysitters to use, although I like them too. My hybrids are awesome for every day use and taking along when we’re out & about. My pockets are perfect for overnight. In order to save money, I varied the types of diapers, and I think that works best. To me, this is like asking, “Is it hard to use real dishes instead of paper plates?” It’s not hard to use real dishes, but it is easier to use paper. So why do we use glass plates instead of paper on a daily basis? Because it’s more cost efficient and less wasteful to do so. Anything that can be thrown away it “easy” to use, but I assure you that cloth isn’t difficult. It just takes a little more work, but I think that is well worth it because of the advantages. Using cloth is such a part of our routine now, it really feels pretty effortless. I buy from Cotton Babies, but there are plenty of places to buy diapers & supplies. ~12-24 diapers depending on your budget & how often you want to do laundry. ~A few Snappis if you’re going to use prefolds. ~Some sort of bag or pail to store dirty diapers in. ~A wetbag for your diaper bag. I have 2 that I rotate using. ~A diaper sprayer is optional. We rarely used ours when Lincoln was exclusively breastfed, but once you start solids, they make your life a whole lot easier. ~Cloth wipes if you’re going to use them. We use cloth sometimes & regular disposable wipes sometimes. There’s so much more I could say, but if you have any specific questions, feel free to ask! The bottom line is that cloth may not be for everyone, but I think more people would choose it if they knew more about modern cloth. We are definitely a fan of cotton bottoms around here!